Welcome to the Topretirements Best Places Newsletter for January 25. Thanks to all the wonderful members who took a few minutes to complete our "Working in Retirement" poll. You folks are the best! The results are in, and in some cases are pretty surprising. See our report below. Thank you! Here is a link to the archive of previous issues. Like your own free subscription to this newsletter? Signup here! 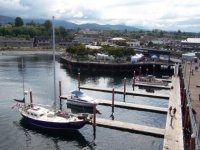 This busy port city on the northern portion of the Olympic Peninsula offers spectacular scenery and recreational opportunities in nearby Olympia National Park. Victoria, British Columbia, is across the Strait by ferry. The survey results from last week are in - thanks to all the generous souls who gave back to this community. Frankly, we were surprised at how many people find some kind of job after they retire. The jobs they get, and their motivations for doing so, are all extremely interesting. Some days it seems like the 3 things you can&apos;t avoid are death, taxes... and best places to retire lists. Some of these lists are good, others whacky or predictable. Here is a roundup of some strange and a few good contenders.